September 1988. 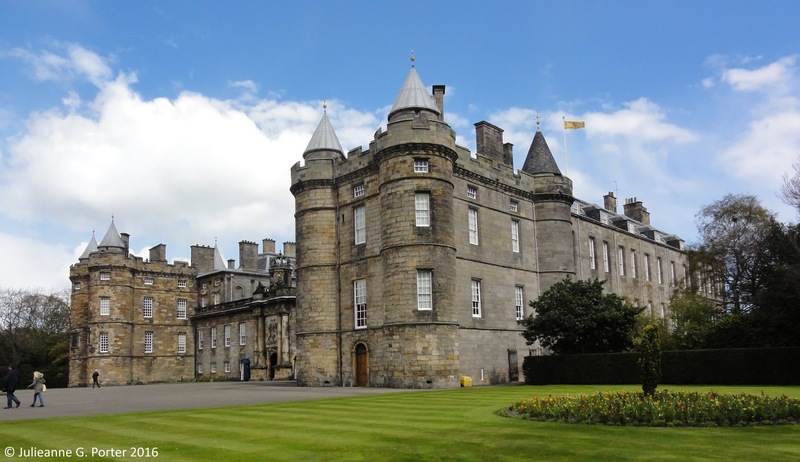 Under grey skies in Edinburgh, 20 year old me stood in the Palace of Holyroodhouse, next to the plaque on the floor telling visitors that this was where David Rizzio, Mary Queen of Scots' Italian Secretary, was murdered in 1566. I was in shock, in awe. Here I was, standing right where this momentus event happened. A direct link to the past. And a feeling that had been developing over the last few weeks as I had been travelling about the UK, was finally realised. At 16 I needed to leave 'home'. So one day I left high school, got a job the next day and 3 weeks later I moved out. I never returned. First I worked in supermarkets, large and small, as a 'check-out chick' and then in a factory sowing the ends of table cloths. I was 'free' but bored. By some sheer luck, one day I walked into the job centre and got an interview for a job in the city at a merchant bank. I became a mail girl and slowly starting working my way up the very lower echelons of office admin. Into my 18th year a flat mate handed me a book called The Crystal Cave by Mary Stewart. I devoured this and the other books in the trilogy and fell in love with the Arthurian legend. For the first time I had a goal beyond just surviving: I wanted to save up to visit the UK and visit some of the places I learned about from the many books I had read on King Arthur and the legends. I did save, but in the meantime I also met the man I thought (we thought) I was going to marry and have children with. In fact I wasn't too sure about the children, but that's what was expected. I was happy. Certainly happier than I'd ever been. I still wanted to go to the UK. He didn't. He wasn't interested at all. Like he wasn't interested in visiting art galleries, so I stopped doing that. I was happy. I was. But I still loved the Arthurian legend and still intended on going to the UK, even if on my own. I went on my own. A month shy of my 21st birthday, I was on a bus touring the UK. Stonehenge, Tintagel (Arthur's birthplace), the Ring of Kerry in Ireland. Llanfairpwllgwyngyllgogerychwyrndrobwllllantysiliogogogoch in Wales(! ), the isle of Skye in Scotland. I kissed the Blarney Stone and tried to dance a Scottish jig. The world was so much bigger than it was before; I don't mean physically, but in my head. As I travelled the UK I became increasingly fascinated with the land and it's history. Each place I visited I left wanting to know more. At Land's End I sat on a heather covered hill overlooking the sea and the landscape spoke to me. For the first time in my life I felt like I had found home. A place I could belong. As the trip continued I become emotionally overwhelmed with something I couldn't name. I was reaching out, trying hard to work out what it was that was there to be heard. Then Edinburgh and Holyrood. 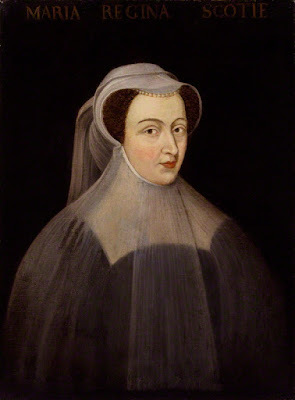 The tour guide gave us the story of Mary Queen of Scots and took us to her bedchamber. 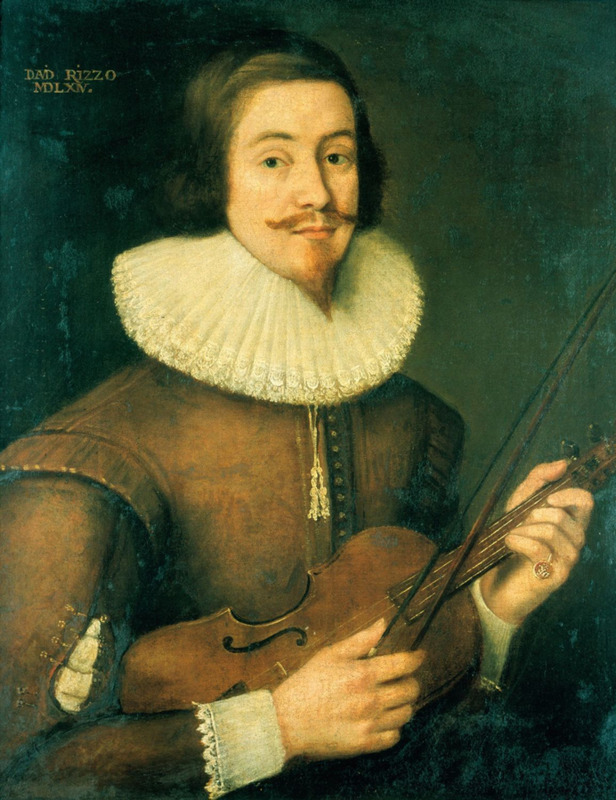 He went into more detail about how one night Lord Darnley, Mary's husband, entered with some retainers, grabbed David Rizzio, who Darnley thought she was having an affair with (she wasn't), and dragged him through Mary's other chambers and finally stabbing him multiple times, leaving him on the very spot next to which I now stood. Plaque image on Pinterest. Portrait via Wikipedia. As I said, I was in shock. And suddenly everything became clear. I wanted more. I wanted to know more, about history, about everything. I wanted to be more and I could no longer be who I was. Or, I wanted that, but more too. Everything changed. When I returned to Australia I decided I was going to go back to night school and study for my HSC (equivalent of A levels). Well my boyfriend wasn't keen on that and tried very hard to dissuade me from going. We were going to be getting married eventually, and have children, I didn't need an education. 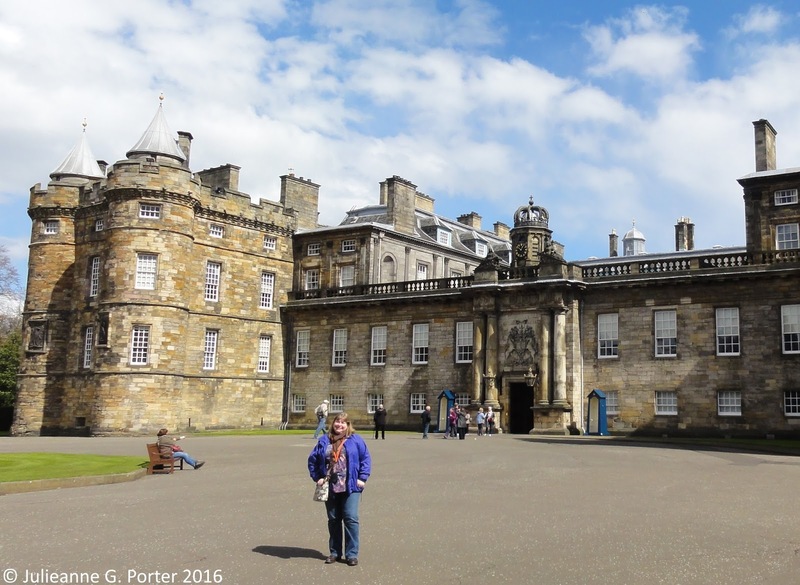 But my travels to the UK and the feeling that coalesced at Holyrood wasn't going to go away. Althought it was frightening, our relationship ended a few months later. He wanted a break whilst I sorted myself out. I was confused, but agreed. But once I was free there was no looking back. So at 21 I started the first of 3 years of night school, studying for my high school certificate whilst working as a full-time temp. I was an average student, but I enjoyed learning. After this I returned to England, living in London for nearly 2 years, doing the 'Aussie working in London travelling Europe' thing. I loved living in England, I loved the UK as a whole. I wanted to stay, it was home. But I also wanted to learn more. Thanks to a friend, Kathryn, who convinced me to apply for university, I eventually did, and at 26 began life as a mature-aged student of History at La Trobe University. This time I studied full time and worked part time for 4 years. By the end of my degree an average student had become an A student. I got 86% for my thesis on a Tudor gentlewoman, and was 3rd in my year. In my last year at university I met my partner Kevin. Together we decided to move to the UK and did so in 1998. I was returning home, for good. and her ladies, from where Darnley dragged him before murdering him. 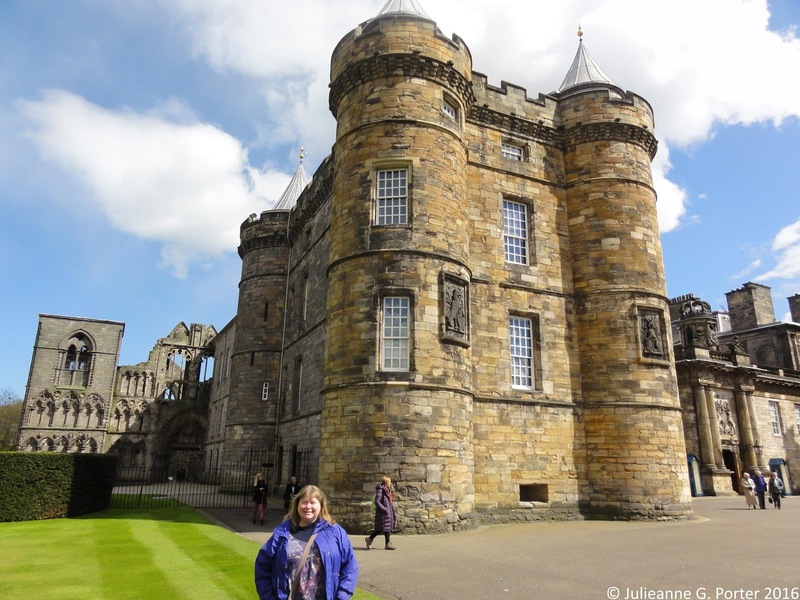 A couple of months ago, Kevin and I decided to go to Scotland for a holiday and this included a week in Edinburgh, thanks to an offer of free accommodation of our friend Anne and Mick. Kevin knew a bit about my 'Holyrood history and the David Rizzio plaque' and on discussing it I realised I needed to visit again, the first time in 28 years. I'll be honest and say that I kept underplaying the importance of Holyrood in my head. It meant something to me once, but no reason it should continue to do so. We queued for tickets and made our way around the palace. As we got closer to Mary Queen of Scots chambers, I got nervous. I was making too much of this in my head, it will only be disappointing. We climbed the stairs. I was exhausted when we got to the top. I have ME afterall, and was already tired, both from physical and emotional extertion. I looked around, listening to the audio guide, and suddenly it was almost like I was 20 again. Only this time I knew the story. We moved into the chamber where I knew the plaque was, but I couldn't find it. In 1988 it was on the floor, but it wasn't there anymore. I eventually found it, but it was on the wall. I was relieved to find it, but confused. I'm sure it had been on the floor. I have such a strong visual memory of it, of me standing next to it, my shoes almost touching the brass. That visual memory has carried me through all these years, so I was a little stressed that I remembered it wrong. Kevin suggested we ask one of the staff in the room, so I did, and spoke with Catriona. I explained my confusion and wondered if anyone knew if the plaque used to be on the floor? She didn't know. I said it didn't matter. But she was intrigued and was trying to think of someone who might have been working at Holyrood for a longer period than she had. Catriona used her walkie talkie and made an enquiry. A mintue or so later someone got back to her and she was able to tell me, yes, it did used to be on the floor, but was moved for health and safety reasons to the wall where it is now displayed. It seems a silly thing, but I was so relieved. I remembered it right, it was all as I recalled. 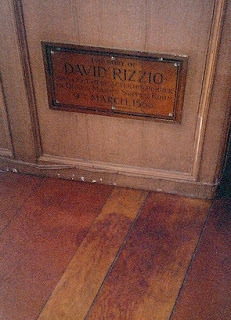 As David Rizzio was connected to Mary Queen of Scots, I was connected to his plaque and that direct connection with history that so left me in awe and led to make such big changes in my life. I thanked Catriona for making that effort for me. I was almost in tears. I was really very happy. I left the room where David Rizzio was murdered, my life in full circle. I'm 48 now. Life might not be perfect, but it is good. And I continue to learn. 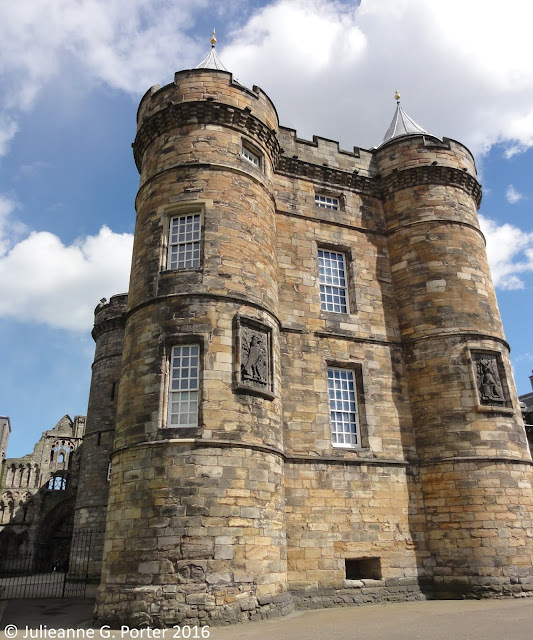 Postscript: Not everyone will experience the same connection to the past that I found at Holyrood, but everyone does have a connection to their past, their history. I believed that it is only by understanding our history that we can move forward to make a better future. History matters. This is such a moving and personal blog post, as well as inspirational. Thank you for sharing! Thank you for your kind words Helen. I both embarrassed and pleased that you think the post inspirational! Really fascinating, and what a wonderful experience you had going back. I like the detail of the plaque having been moved! I hadn't realised I needed to take the trip, but now I've done it, it seems so obvious. I'm glad I did and it's been lovely to receive such positive comments from people here and on Twitter. Well, if that's not a ringing endorsement for having the courage to follow your dream, I don't know what is! Good for you, Julieanne.